Razer is best known for its line of gaming peripherals, particularly mice and keyboards. Taken in that context, Razer's elegant-looking laptop, with its quirky keyboard layout and 17-inch display, can be thought of as the ultimate gaming peripheral. As a general purpose or desktop replacement laptop for everyday computing chores, though, it's less useful, of occasionally downright frustrating. First, though, let's talk about the good. The Blade is built into a chassis just 0.88 inches thick, weighing in at 6 pounds, 10 ounces, and an almost even 7.5 pounds with the amazingly small power brick. Since the Blade ships with a 17-inch, 1080p LED backlit screen, that sub-7 pound weight is actually impressively light. The whole package, when closed, looks like the evil twin of Apple's now-defunct 17-inch Macbook Pro. When you pop open the lid, you start to realize you're not in Kansas anymore. First, the trackpad is not below the keyboard, but to the right, where most big laptops locate a numeric keypad. Second, it's not just a trackpad, but a small, 800 x 480 pixel color LCD display in its own right. It's a full multi-touch trackpad supporting gesture recognition. Placing the trackpad on the side means you never accidentally send your cursor shooting across the screen when you type. However, if you're used to standard laptop touchpad placement, you're going to spend some frustrating hours adapting to the new location. Above the pad are ten programmable keys, each of which is also a tiny color, 115 x 115 pixel, LCD display. At boot time, the keys populate with a default set of macros, which include Facebook, Twitter and Gmail keys. When you press the Twitter key, for example, your Twitter feed appears on the display built into the trackpad, not on your main PC screen. One seemingly useful program turns the trackpad into a numeric keypad. Razer calls this combination of visual touchpad and programmable keys the "Switchblade User Interface." Switchblade includes programs for Battlefield 3, Star Wars: the Old Republic, Counter-Strike and Team Fortress 2. If you play something else, you'll need to program your own macros through a cumbersome process of recording macros and assigning them to keys, but you only have to do that once. Razer includes a large array of icons suitable for a number of different games, which you can load into the visual hotkeys. The 120W power brick is roughly ten ounces, and pretty compact, which makes carrying the whole package around easier than most 17-inch laptops. The keyboard area is sparse, with no buttons beyond the dramatic looking live keys on the right, plus the standard keyboard. The Blade doesn't include an optical drive, which is unusual for a desktop replacement laptop. Given the system's tight focus on PC gaming, however, it's not an unusual lack these days. Most PC games are available via digital distribution from Steam, Amazon, EA's Origin and other digital delivery services. First impressions are well and good, but when delving a little deeper into usability, the Razer Blade starts to look a little tarnished. The keyboard is a good example. Razer advertises the keyboard as being "anti-ghosting", which means the keyboard will recognize multiple simultaneous keypresses, a feature definitely useful for gaming. As a keyboard -- something you use for typing documents -- it's not so hot. First, the layout is odd. The DEL key is just above the backspace key, and they're both the same size. So it's easy to find yourself pressing the wrong key if you're not looking at the keyboard. The left and right arrow keys are full size, but the up / down keys look like a single key split in two. My stubby fingers would often press the wrong key, or both at the same time. Turning the touchpad into a numeric keypad sounds like a great idea, but then you can't use the touchpad as a pointing device. In fact, most of the programs for the Switchblade interface disable the touchpad as a pointing device -- which means you almost certainly need a mouse. Since this is a gaming laptop, you'll likely be carrying a mouse around anyway, since a touchpad is an abysmal pointing device for most PC games. Still, there are times, such as when you're traveling, where having both a numeric keypad and integrated pointing device would be useful. The keys on the keyboard lack any sculpting, so your fingers slide onto the wrong keys too easily if you're a touch typist. The keys depress only a short distance, which takes some getting used to, but the keys offer a discrete (but quiet) tactile click when you press them. One major annoyance is the reliance on an always-on connection to the Internet to be able to use the Razer Synapse programming tool for the Switchblade interface. Whatever genius at Razer dreamed up this idea needs to have his head examined. Are we really going to pirate an essential tool used only for Razer devices? Does Razer really want to track everything its users are doing, without giving an opt-out? It's a purely dumb idea. You'd expect a gaming laptop to offer a good display. The LCD panel on the Blade is a bit of a mixed bag. You get little visible tearing at high frame rates, and color saturation looks about right. However, some high definition video content exhibited visible banding and noise, particularly in sky scenes and other scenes with monocolor gradients. Standard definition video looked overly soft and a little washed out. Game content fared better, but you could still see color banding in the occasional scene. Overall, it's an okay display for gaming, but it's not so good if you plan on using the system for video and photo editing. Sound quality is about as good as it gets for a laptop. There's no deep bass, and volume levels never get particularly high. The included Dolby Home Theater v4 does a nice job of making music sound both full, yet neutral for the most part (except for the lack of bass.) Movie audio was slightly less robust, but enabling dialogue enhancement improved the experience. Game audio was fine, if a little thin, mostly due to the lack of deep bass effects. While you'll want a headset for the most robust audio experience, the overall sound quality with the built-in speakers is pretty darned good. All the ports on the Blade are built into the left side of the unit, save for the Kensington lock slot. The Blade includes three USB 3.0 ports, a combo audio jack, a gigabit Ethernet connector and an HDMI video output port. The system lacks a slot for flash memory cards, but does include Bluetooth 4.0 and 802.11 A/G/N WiFi connectivity. Razer's Blade offers a rich set of components which enable solid game performance. The CPU is an Intel Core i7 3632QM quad core mobile processor, with a base clock speed of 2.2GHz, but can push one core up to 3.2GHz using Intel's Turbo Boost technology. Base memory is 8GB, and storage chores are handled by a 500GB, 7200RPM Hitachi hard drive. Hard drive performance is accelerated by the presence of a 64GB SSD, which is used as a massive cache for the hard drive. Game graphics chores are handled by an Nvidia GTX 660M mobile GPU, with 2GB of frame buffer. Note that this is the mobile GTX 660M, so only has 384 shader cores (the desktop 660 includes 960 cores), so overall graphics performance is more like the desktop GTX 650. The system supports Nvidia's Optimus technology, which improves battery life by allowing the laptop to use Intel's HD 4000 integrated graphics when running Windows desktop and non 3D-intensive applications. Overall game performance is still pretty good. The system was able to hit just over 30 frames per second (FPS) in our Crysis test at the native 1920 x 1080 with settings at high. Changing the settings to Ultra pushed frame rate down to 21 FPS, which is unacceptably slow. DiRT3 ran at a very good 53 FPS at 1080p with Ultra settings. The 3DMark 2011 performance score comes in at 2652, which is pretty good for a mobile system, though can't hold a candle to most desktop gaming rigs. 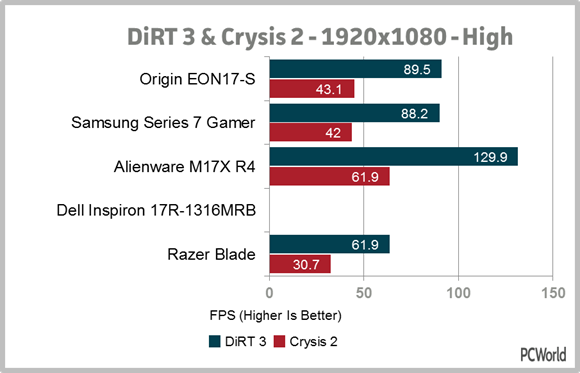 By way of comparison, the Samsung Series 7 Gamer, which uses a GTX 675M mobile GPU, can push 42 FPS on Crysis 2 at 1080p high settings. 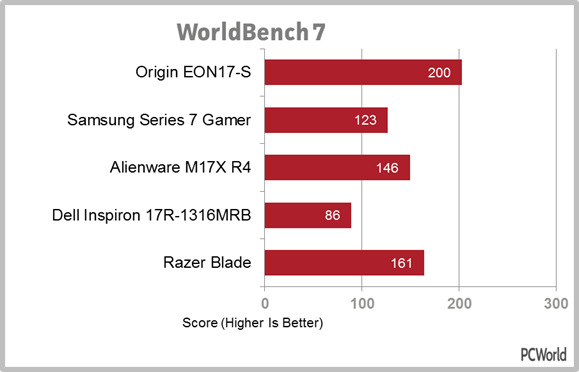 Turning to more general purpose performance, the Blade managed an impressive 161 on our PCWorldBench 7 test, besting the 146 posted by the Alienware M17x R4. Startup time is speedy, too, at 17.5 seconds, faster than systems with dedicated SSDs. 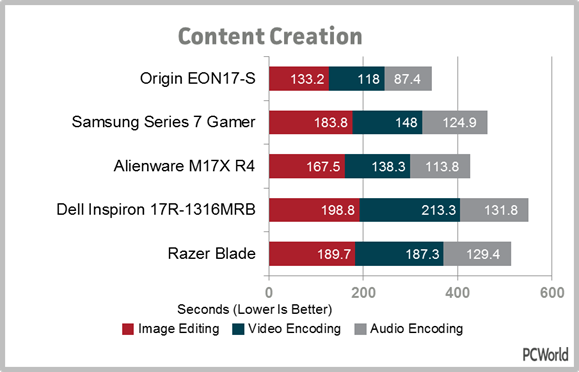 The Content Creation score falls a bit short of the completion, slower than the Samsung and Alienware units, and nowhere close to the Origin EON17-S. 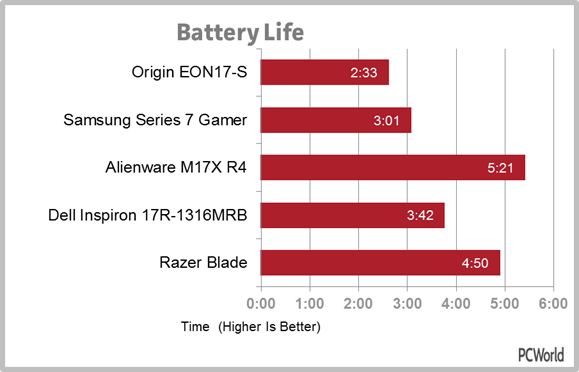 Battery life is measured at 4:51, about a half hour shy of the 5:21 battery life of the Alienware, but better than the other systems in our test. However, it's worth noting that the Blade is lighter and thinner than all those other laptops; the lightest competitor is the Samsung Series 7 Gamer, which weights in a hefty nine pounds. If I could give the Razer Blade a score based solely on using it as a mobile gaming platform, I'd probably give it a 4 (out of our maximum 5.) The unique Switchblade UI is pretty cool, and performance is generally adequate or better for most games, though you'll still want to dial back detail levels a bit for best frame rates. However, we review all laptops, not just gaming systems. As a general purpose laptop, the Razer Blade doesn't quite measure up. The keyboard is a mess for normal typing, and the overall LCD quality falls short for video or photo editing. Requiring a mouse when you fire up the Switchblade UI is a bit of an annoyance, as is the need to be connected to the Internet to make maximum use of the Synapse programming tool. So if you're a LAN party aficionado looking for something lighter than the usual massive gaming laptops, Razer's Blade is a sleek system that will turn heads. But if you're looking to acquire a thin, light 17-inch laptop as a tool for photography or other general use, you'll want something else.